The Oldest Relay Race in America! It all began as a dare in 1959. A team of runners from San Jose State College thought, “Hey, I bet we can run around Lake Tahoe!” This feat seemed massive but attainable in their minds. 72-miles around a pristine mountain lake at nearly 6,000 feet above sea level is NOT a normal afternoon run. Over the next New Year’s holiday, they did just that! Looking back at what they had accomplished, it sparked the idea of what would become the OLDEST relay race in the United States and quite possibly North America. 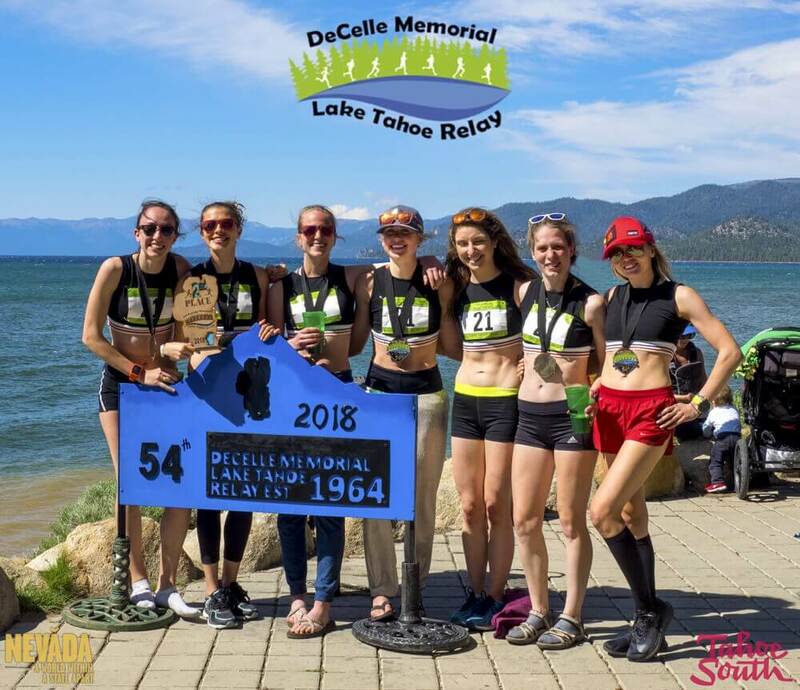 What’s The DeCelle Memorial Lake Tahoe Relay? The relay has become an annual tradition for multiple generations of families and friends. The race was renamed in 1971 to the DeCelle Memorial in honor of one of the founding father’s sons who was killed in action during the Vietnam War. Starting in South Lake Tahoe, the course follows the 72-mile shoreline around the entire lake finishing back where it started. Each leg of the race is 8 to 13 miles in length, exposing runners to some of the most majestic views on the planet AND an opportunity to create team camaraderie that isn’t found anywhere else. Besides all the amazing tradition, this year’s edition has A LOT of exciting things happening. For the third year, the Lake Tahoe Relay is offering runners a chance to complete the race as an Ultra-marathon or 2-Person relay race. The best part? Whoever wins these races can set a record for the category! Sweet! To embrace the community just as much as last year’s race, they moved the start/finish to the beating heart of South Lake Tahoe – the Lakeview Commons. Contestants were so happy with the change that they’re bringing it back. It showcases the splendor of the lake, gives access to the beach AND taps into the pulse of our town. Talk about a great way to sum up the journey! After such a long adventure, what’s the best way to celebrate? A Beer! So at the end of the race, be sure to grab a FREE cold one. And the best part? Sufferfest’s beer is good for you! Talk about a win-win. These aren’t the only new, exciting things happening this year. If you want to hear more, be sure to sign up for the Lake Tahoe Relay newsletter and stay in touch for all the announcements surrounding the race. Need Another Reason To Sign Up? How About A Discount! To celebrate spring as well as Easter on April 21st, they’re running a sale of 11% off IF you Register by Sunday, April 21st! So, lace up those running shoes and grab your water bottle. Hop out of that chair like the Easter Bunny and sign up for the Lake Tahoe Relay. How do I get my 11 percent off? Visit the Lake Tahoe Relay website and REGISTER by Sunday, April 21st – 6:00 PM PST! Enter the Coupon Code ROADKILL and you’re in! GOOD LUCK! The DeCelle Memorial race crew is always looking for different ways to help more folks try the race themselves. If you can’t make a full team or want to race but don’t know any fellow racers, join the Facebook group they created to help out. Meet new people, find eager runners and create teams for race day!